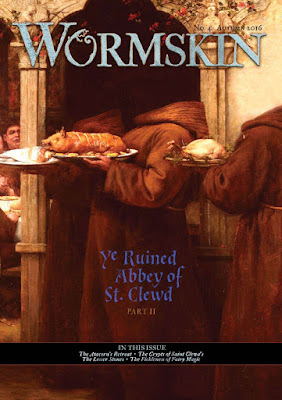 The Wormskin fanzine, published by Necrotic Gnome Productions is written for use with Labyrinth Lord and issue by issue, details an area known as Dolmenwood, a mythical wood, an ancient place of tall trees and thick soil, rich in fungi and festooned with moss and brambles and rife with dark whimsy. Wormskin No. 1 was published in December, 2015, and was followed by Wormskin No. 2 in March, 2016. Both issues introduced the setting with a set of articles rich in flavour and atmosphere, but lacking a certain focus in that the region itself, Dolmenwood, was not detailed. Fortunately, in March, 2017, Necrotic Gnome Productions released Welcome to Dolmenwood, a free introduction to the setting. Further, Wormskin No. 3, published in July, 2016, improved hugely upon the first and second issues such that it serves as a better introduction to Dolmenwood, giving some excellent answers to some very good questions before delving into what is the biggest secret of Dolmenwood. 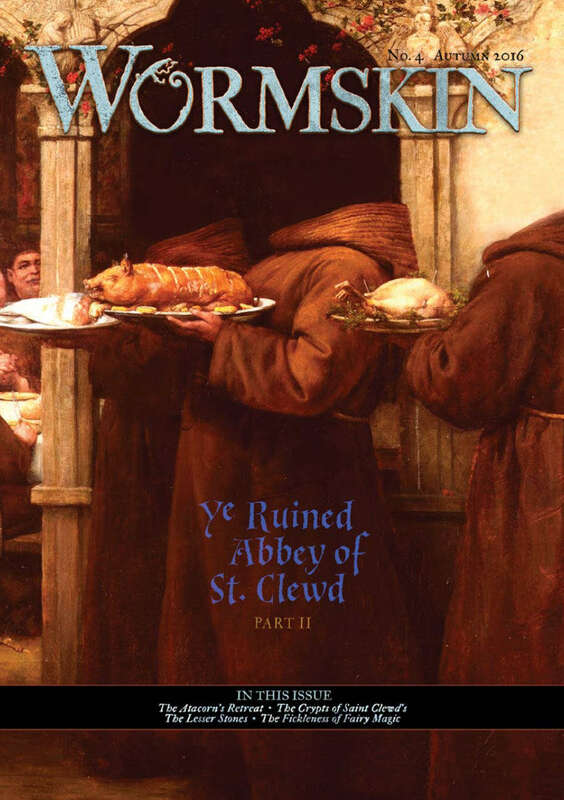 Published in the autumn of 2016, Wormskin No. 4 is essentially the companion to Wormskin No. 3. It is not quite as useful, but it does complete the content of Wormskin No. 3. To that end, the last two-thirds of Wormskin No. 4 is devoted to the second part of ‘The Ruined Abbey of St. Clewed’, begun in the previous issue. The first part describes the ruins of the abbey that was originally built upon the site where Saint Clewed died fighting and defeating an evil black unicorn. Exploring the grounds is relatively safe for low Level characters, but the crypts, halls, and tombs of the remnants of the abbey’s underground are another matter. Getting into the crypts will be a challenge in itself, but once inside, the player characters will find an interesting environment. The religious theme and iconography are nicely carried applied throughout the crypts, although its obvious Christian influences may not sit easily with every Dungeon Master’s campaign. The crypts are as you would expect they are home to all manner of undead, but they are also home to secrets which the inhabitants do not want revealed. This gives an interesting tension to the ‘dungeon’ because many of will still interact with the player characters. On the downside, the dungeon is essentially on a knife edge and it is quite possible for the player characters to upset the proverbial apple cart. Unfortunately, the description of the dungeon never addresses possible outcomes or effects of their intervention, which is a missed opportunity given the nature of the secrets it contains—secrets which lie at the heart of Dolmenwood and which when revealed have possible repercussions across the region. Nevertheless, the dungeon is well presented, its themes and iconography are nicely applied throughout, and the map is well done. The issue though opens with ‘The Atacorn’s Retreat’, a description of the second eldest mule-thing born of a witch-mother and his father, the Nag-Lord. Known as ‘The Fiddler in the Dark’, Farthigny is a humanoid with a mule’s head, cow’s tail, and curved horn jutting from his chin. The latter is curved enough for him to fit strings to and play as a fiddle using his enchanted fiddle bow. He is known for the drunken revels he hosts at his cottage and the poor way in which he treats his Moss Dwarf servants. The description of this interesting NPC is accompanied by a fetching full-colour illustration, adventure hooks and rumours, and a complete guide to his cottage. This piece feels fully rounded out and worked into the setting of Dolmenwood. It is probably better suited as an encounter for mid-Level characters, especially Bards, and there is scope for the Dungeon Master to include Farthigny as a recurring NPC. ‘The Fickleness of Fairy Magic’ does not look at the trinkets and gee gaws that might slip out of the Elven realms to be found by mortals and seen as wondrous. Nor describe a single such one. Instead, the short one-page piece suggests what might cause them to cease functioning, such as the touch of sunlight or you stop looking at it. As the end of an article detailing the trinkets and gee gaws these effects would have been fine, but without such novelties and curios, the article is really only of passing interest. The third of the smaller pieces in Wormskin No. 4 is another set of tables and lists. ‘Lesser Stones of Dolmenwood’ provides options for the minor monoliths that can be found throughout the region. After determining its broader location, the Game Master can, with a roll of a thirty-sided die or three, create the material a lesser stone is made of, its form and condition of its surface, setting, and unusual properties and features of note. These work as oddities and weird features as much as they can be spurs for adventure, adding further colour and flavour to the region. After the blaze of colour and change in style with Wormskin No. 3, this is continued with Wormskin No. 4. It is applied with some restraint though, giving the issue a nicely assured feel. That said, Wormskin No. 4 is not as useful or as good an issue as Wormskin No. 3, primarily because ‘The Fickleness of Fairy Magic’ is all too slight, if not feeling incomplete, and because the second part of ‘The Ruined Abbey of St. Clewed’ does not explore possible outcomes of it coming into contact with the player characters. The ‘dungeon’ is well designed as a location though and will provide several good sessions of play and interaction with its NPCs. Simply, Wormskin No. 4 is not as good as Wormskin No. 3, but Wormskin No. 4 both serves as a complement to Wormskin No. 3 and fills in further details of the Dolmenwood setting.